This is the second issue of the 'in-house' magazine published by Hagerty the collector car insurance company in Traverse City Michigan. 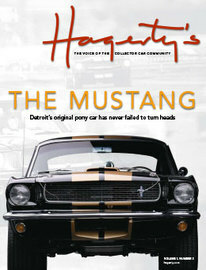 The magazine started in early 2006 as a 24-page marketing tool for their business and was sent out to clients who insured their car with Hagerty. Originally titled Hagerty's, ten years later it has grown to full-blown 84-page car magazine and is now simply called 'Hagerty' and published with the ISSN number 2162-8033.